SUMMARY: Critical investigation of public beliefs and press coverage of the latest scapegoat breed, the Pit bull; and of fatal dog attacks in general. AUDIENCE: Any dog professionals working with dog aggression or bite risk assessments needs to read this book. The author: Karen Delise was trained as a veterinary technician. She is also a talented amateur historian and investigative journalist, judging by this book. Style and contents: Karen Delise digs beyond the grabby headlines, and goes after the (often aberrant) reasons behind the dramatic attacks reported in the press. She goes beyond breed stereotypes and analyzes why each particular incident took place. She then takes a step back and examines reported attacks through history, then looks at how these incidents are reported in the press. She also reviews the ‘bad press’ breed as they each take turn as the latest scapegoat since the 1800’s: bloodhound, bulldog, German shepherd, Doberman and the latest mug: the pit bull. And she examines the self-fulfilling prophecy that is giving a breed a bad name: more ‘wrong’ owners will want this breed for the wrong reasons, so more dogs of that breed will be raised ‘wrong’. And there you have your usual ‘bad breed’ vicious circle which no amount of Breed Specific Legislation will ever break. The chapters detailing the circumstances around the severe attacks reported in the press make for gruesome reading, I won’t lie to you. As does the chapter on dog fighting. But this close look will give you a better understanding of the factors behind nearly every dog attack: a dog that is severely abused, neglected, under-socialized and often taunted. 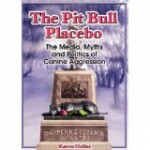 The book’s message corroborates Janis Bradley’s in “Dog bites” to a T: pit bull paranoia (and dog bite paranoia for that matter) is just that: paranoia; an obsessive fear of a microscopic risk. The two books are similar in other ways: they are rigorous in their research, scathing in their criticism, and written for the layman. Both great reads. It is perhaps suitable that a book featuring terriers should have its author so doggedly determined to chase the details of every claim back to its origin. This diligence is what makes the book so powerful: it dissects the various strands of misinformation about dog breeds, and exposes them to the light of facts, revealing them to be the scaremongering memes they are. Insightful review of the history of dog bite epistemiology. Yes, yes, yes, yes, yes! A book that cites its sources in-text. Congrats to Karen Delise on her transparency as this is a rare move in non academic publications. Her look into the (entirely made up) crazed Doberman theories gave me a few ha haa moments as I realized that I too believed these stories as a kid, and that my parents probably still do. A historical overview table (in appendix) showing all reports of a serious dog attack since the 1800’s in chronological order, and featuring all relevant details of the attack. An invaluable tool for anyone wanting to glance at trends and common factors behind severe aggression. To me, the take-home message – the message I have to pass on to my audiences – was this: “The media is NOT a credible or impartial source of information on the nature or behavior of dogs involved in attacks” (Appendix C). The passages about bloodhounds ran a little long for my liking. You’ll come out of this book as a specialist in this historical breed. Not exactly why I had picked it up myself. There are a couple of mentions of dogs being pack animals/about dominance (treading into dodgy definitional waters here, Ms. Delize), and about dogs being predators (overtly incorrect: in terms of food habits, they are scavengers). But this does not form the core of the book, so it’s a complete aside. Browse the Book Review archive. Genre: pop science. Author: Delise Karen. Reading Level: Professional. Star: 4. Bookmark the permalink. Post a comment or leave a trackback: Trackback URL.